At one point in our sailing careers we were probably presented with a picture, or at least an explanation that looks a bit like the one below. A boat tacking upwind works it’s way back and forth on 45° angles, staying within the laylines shown by the solid blue lines. A common recommendation is often that you stay inside a pair of secondary boundaries (shown by the dashed blue lines) – the intention being that you won’t be likely to overstand the mark if or when the wind shifts. Being on the layline too early is rarely a good idea in RL racing. Not only will the shifts get you, but you are showing all of your cards early, and have limited tactical control over the fleet. In virtual sailing, we do tend to cut it pretty close on the laylines once we’re inside the weather update window because we have 100% foreknowledge of any relevant upcoming shifts. We’ll need to be careful though… the most common misunderstandings of upwind sailing are based in these “common knowledge” concepts. Since we have the polar in the diagram, It’s a good opportunity to look at how it is showing us what we already know, so we’ve got some more arrows in the quiver later on. In a constant wind like this, our goal is to maximise speed directly into the wind and toward our next mark. So long as the waypoint is inside our laylines, we’ll tack on the VMG angles to get there – a situation that gets the nickname “pure upwind sailing” on SOL. Our polar diagram is lined up with the wind arrows, and our target is set to 0°. The horizontal red line is showing us the maximum points for VMG, and in this case you can see that both tacks are equal. You can choose either one and everything will work out the same. Armed with this knowledge, the next step for most sailors is to start looking around to see if there is more wind on one side of the course or the other. I can honestly say that I’ve never sailed in wind like the sailing-school whiteboard example. There is always some variation, even if it’s a degree or two, or an extra tenth knot of wind. Around my home waters it’s more likely to be 40 degrees and 3 knots (in a 4 knot average wind mind you…). Oscillating winds present a huge opportunity to edge out other boats. Most racing sailors know to “tack on the headers”. Figuring out how to do that round-the-buoys when you have only realtime data at your disposal is an art in itself. You need to keep track of what your averages and highest and lowest headings are, as well as trying to identify patterns in timing, while sailing as fast as possible. If you tack when you are first headed, you are usually tacking off of your lift, and if you wait too late you’ve been sailing the wrong tack for too long. You need to try to keep options open in case the wind changes more than expected, figure out if the shift is going to reverse of if it might be persistent and change tactics at the start and as you approach the mark! Most boats take years learning to get it right, and it takes hard work to play the shifts consistently. Virtual sailors learning how some of this works have a big advantage in that we can see our weather at least a few hours out. This lets you concentrate on figuring out the best angles without the burden of trying to outguess the competition on when the next shift will occur. Learn to get it right here and you’ll have a big leg up when it comes to applying the same ideas on the water. If you are coming the other direction, one caution is that online sailors with RL race experience I think tend to underestimate the importance of playing the shifts perfectly – particularly if they race dinghies or sportboats, where boathandling is so important that crews don’t have time to spare keeping track of details. Keeping things simple, the example above presents one whopper of a shift halfway up the leg. Although you could argue that it’s the an oversimplification, the same ideas apply to the tiniest of shifts – and the angles shown make it more obvious what is going on! You don’t need the polar overlay to be able to figure out that one tack is heavily favoured, but we can use it to reinforce a few ideas. At the bottom polar, our two available tacks on the maximum VMG angles are shown by the black arrows again, with the red arrow indicating our upwind target, and the polar rotated to align with the wind arrows. In this case, even though the two tacks are “equal” when it comes to VMG, we can see that the Starboard tack option is the better choice for the first half of the leg as it points us in the right direction. The shift up course is conveniently placed to allow us to the lay the mark on on two fast tacks! If the shift wasn’t there, this would dissolve into “pure upwind sailing”, and it wouldn’t matter which tack we took first as it would all come out in the wash by the time we lay the mark. The presence of a shift changes the game. Try to plot out what would happen if we sailed even just a little ways on port in this example… Everything is looking good at the beginning, and when you tack you are still “even” with the Stb-tack boats in terms of distance to windward. When they tack back you’ll cross, maybe even a little ahead if you had a little more wind on this side? But they don’t tack… they carry on until the shift kicks in, tack onto port and are laying the mark. Not only are you now behind them, but you’ll need a third tack to make the mark, and adding insult to injury the angle on it is going to be awful. The “bump” on the polar that is closest to where you want to go is usually the tack you want to be on, barring compelling reasons for choosing the other one! If VMG is just the windward component of speed, what is VMC and why is it useful? While VMG measures speed into the wind, VMC measures it toward an arbitrary target. The easiest way to define the target angle when using a polar diagram is to translate it into a TWA. If we assign a target TWA of 0° or 180°, we can find the maximum speeds up or down-wind. These angles are the same as maximum VMG. On the sample polar above, one windspeed has been isolated for clarity. The red arrows show the target directions, and a line at right angles to it helps to show the point on the curve furthest forward. For the upwind case, the tangent point is ~37°. Things get more interesting when you pick any other target directions. We’ll get into how you pick your targets in a later entry. In this example, we’ve picked a target angle of 30°, indicated by the solid red arrow. Remember that this is measured from the wind direction or TWD. Being able to switch from compass angles to polar angles is a good skill for both real-life and virtual sailing. This example could apply to a situation where the wind (TWD) was from 25° and the CC for our target was at 55°… the important thing is the angle of the target relative to the wind. The “ladder rung” for the 30° target is tangent to the polar at the maximum VMC – in this case a TWA of 50° shown by the solid black arrow. Just like sailing upwind, choosing the maximum VMC angle will move you toward the target the fastest. You can see in this example, it will also move you off track, and you’ll have to figure out a way to get back to windward if you are trying to lay a waypoint or mark. Later, we’ll look at how to use an expected windshift to accomplish this. Notice that there is a second maximum for the other (non-favoured) tack, shown by the dotted red line and black arrow. In real-life racing there are often tactical reasons to sail the “wrong” tack – controlling other boats, or maintaining position at a start are common ones. Sailing “high” on the non-favoured tack is also part of the technique of “Wallying” in puffs and micro-shifts, where you sail VMC on one tack because the timescale of the changes in wind is too short to justify tacking on the headed wind. Sailing the slower tack happens less often in virtual sailing, but you can sometime get caught the wrong side of an update or stuck up against a shoreline. Rotating the polar is a good trick to help visualise the angles and maximum values a bit better. If you are using a paper chart, laying the polar on top gives you an instant picture of how the fast angles relate to your course and any marks, shorelines etc that might be in play. We’ll show how to do the same thing in SOL as well, where you have the added benefit of being able to instantly align the polar to the correct TWD using the onscreen wind arrows! For the last few races, I’ve been posting a polar suitable for on-screen use in the “SailTalk Only” chat area of sailonline.org. I’ve now moved the existing ones to this blog (under SO76TP Polars tab) and will continue to add new boats as they are needed. The design of the polar is still a bit of a work-in-progress – suggestions on how to make them more useful are very welcome. Our sailing “Polar” is a diagram showing boatspeed across a range of wind angles and wind speeds, displayed in polar coordinates. Angles are measured relative to the wind, and shown as “true wind angle” or TWA. Speed is plotted radially outward. Polar diagrams for sailboat performance always show a heart-shaped curve, since we can’t sail directly into the wind. At left is the on-screen polar as displayed by sailonine.org. Straight lines radiate from the origin at 10-degree angles starting from 0º directly into the wind showing the TWA. Boatspeed for different wind strengths are shown by the curved coloured lines, and an additional black line and angle are displayed showing current conditions. The shape of the lines can show how the boat’s performance varies as it changes sail, can carry downwind spinnakers or reaches surfing or planing speed. We can use the polar diagram to determine the best angles to sail. One of the first things that most sailors are taught is that sailboats need to tack upwind, and almost invariably the angle used to demonstrate is 45° – a pretty safe starting point. We quickly learn that pointing too high or sailing too far off the wind is a slow way to get to windward, and before too long figure out how to read the luffing of headsails or the behaviour of tickler or telltales to make sure that we are sailing the best angle. In reality, we aren’t sailing 45° anymore, but constantly adjusting our angle to the wind as conditions change. 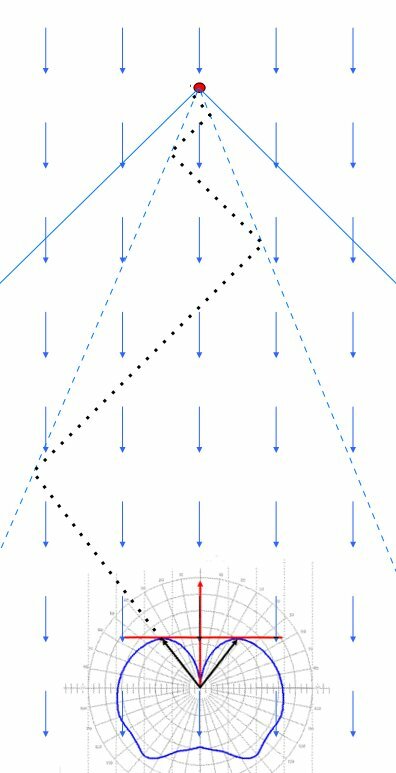 We can’t use sailtrim as a way to pick angle in virtual sailing, but the polar diagram shows us the effect of pinching or footing, and we can use it to pick upwind angles across the whole range of windspeeds. If we are trying to get to windward on a beat, it stands to reason that the best angle is the one that gets us there first. On a polar, the vertical axis shows the speed that the boat is making into or away from the wind, “Velocity Made Good” or VMG. This is the upwind component of speed that you average toward the windward mark after all the tacking has been taken into account. To find the maximum VMG, you just pick the point furthest forward on the polar – in the example diagram, this is shown by the black dot at TWA 37.33 and speed 11 knots. Best VMG for the 90 foot monohull in close to 15 knots of wind (the cyan curve) is 8.77 knots. If we point any high than this, we’ll be pinching, and sailing slower. If you foot a bit (sail a little further off the wind), boatspeed will be higher, but distance sailed will be longer and the angle will work out slower in the end. We use VMG the same way on downwind legs. The point on the curve furthest to the bottom of the graph is the fastest way to get downwind for the current conditions. Most boats that can fly extra sail off the wind gybe back and forth to maximise speed downwind. For our 15 knots of wind – the best VMG downwind will be around 145°. In which we present an overview of a possible learning path for an average sailor… This might not describe you! An ongoing discussion in the chat on sailonline is the issue of software routing solutions. Among the “sail-by-feel” fleet, there exists a school of thought that holds that any “math” based assistance is outright cheating, while many others value the “near-perfect” solution presented by the top-tier router boats as a standard against which they can compare their own performance. There is a whole spectrum of opinions in between and indeed the determination of what consists a software-based solution is anything but clear cut. What is undoubtedly true is that winning on SOL requires hard work, a fair amount of time, and a healthy dollop of luck. These pages will be a work-in-progress attempt to get some of the ideas I’ve been working with down, and available for discussion. The ultimate goal is a set of tutorials that I hope will be useful to interested boats on sailonline and sailors everywhere.